It's increasingly important for business owners, like yourself, to be on the web and be able to engage customers old and new alike. At MerchantCircle, unlike other online directories, we offer you a listing that you can claim, upload pictures, build coupons and ads, blog, and send out newsletters to your customers - free of charge. We're happy to announce today, that not only do you have a free web presence that lists you high on search engines, but also gives you easy access to some of the best ways to promote yourself all over the web. It's like a one-stop shop that will proactively make sure you're listed all over the web and have proven, affordable advertising options at your fingertips. Our newest partnership with WebVisible will enhance our proven record of helping you connect with more of your local customers and fellow business neighbors. 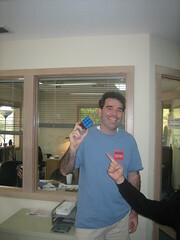 Almost 27 years after the Rubik's Cube was released, one of our most talented engineers, Jason, has finally solved it. 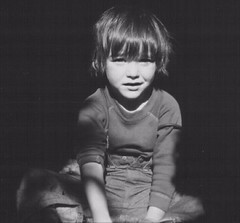 To the left is a picture of him as a child, when he first laid eyes on that square object of mix-matched colors. Below right is a picture of Jason seeing the Rubik's Cube for the first time with the same color on each side! Congratulations Jason, from the MerchantCircle team, on this crowning achievement of your life! P.S. Please let us know how long it took you to complete the Rubik's Cube. Our life of criticism and analysis has become more and more outbound. It use to be, you kept your thoughts in or shared them with friends and family. Now it's, 'I have a forum on the web.' Whether it's Myspace, Youtube or practically anywhere on the web, we're learning to be more extroverted. We've written in the past about this wealth of outside critiques, particularly in the realm of business reviews - on our site and in general. Check out this blog post from Greg Sterling about what one business owner decided to do about a business review site, and then opened up a Pandora's Box of online dialogue - much of it, very funny. This points us back to MerchantCircle. We remain firmly committed to ensuring business owners can engage with their customers and potential customers online - and we don't charge you for doing this. Check out the blog post and let us know what you think. Reputation Rating, Reputation Score.... Oh My! When it comes down to it - the search engines don't give two cents about you. (10 cents a click - maybe. But you the business owner? No.) You've got to make things happen for you. Showing up high on search engine results is almost imperative for business growth. Take for instance my experience yesterday. I was calling limo and bus services around the Napa/Sonoma Valley areas and I couldn't find any options left until the 4th page of results on Google. Can you imagine how great it must be for those transportation businesses that are listed on that first page of results - to always be sold out or utilizing all resources? Anyway, not everyone can hire a marketing firm or search engine optimization specialists for thousands of dollars a pop. That's why we at least try to lay out guidelines that will help you come up higher in search engines - thus the 'reputation score' and 'ratings'. Let me explain: Reputation scores, (like the one above), start off low until you create more content. Each picture you upload, coupon you build, blog you write - brings your score higher. This is to help you understand you need to create more content to get your business listing as high on the search engines as possible. Even if you have a website, it's good to list it on your MerchantCircle page - and vice versa. This is called cross-linking. This is another area where you have a reputation score. It points out whether you are listed on a number of yellow page directory sites. If you aren't, then that's one less chance for a customer to find you on the web - thus the lower reputation score. We do provide you with the links to each site so that you can take proactive steps to remedy the situation. All of this is free. We only want to make sure that you know you have to be on the web, take proactive steps, and find new customers. We make it easy for you.